Its official! 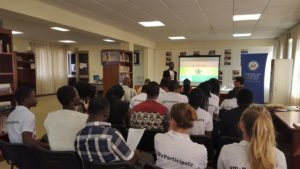 The #WeParticipate project was launched yesterday, at the American Corner, Leciad, University of Ghana, by the project leader, Eric Opoku Agyemang and the 20 campaign ambassadors. Special guests present were representatives from Young African Leaders Initiative (YALI) RLC and National Commission for Civic Education (NCCE), the Awutu Senya West District Director (NCCE), the National Deputy Director of programs of the NCCE, Gladys M Osman, and Daniel Fennel, Counsellor, Head of Public Affairs, United States Embassy Ghana. Eric Opoku Agyemang, introduced the project to all present, detailing the objective of the project which is to promote a peaceful election and increase voter turnout especially among the youth. He also talked about the target areas (Awutu Senya East and West District), and the methodology of the project , which would be carried out by the campaign ambassadors. Gladys M Osman, enlightened all present about the mandate of the NCCE as cited in the constitution and explained various key and sensitive aspects of the electoral process in Ghana. She talked about voting being a civic right and responsibility and cautioned all about the implications of not participating in the process. 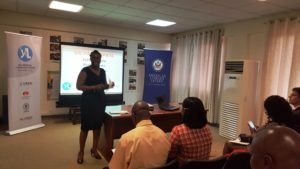 She also asked the campaign ambassadors to be vigilant in identifying politicians that seek to buy their vote, thus conscience of citizens. She stressed that it was an offense and if citizens have the right evidence can sue such culprits and also informed all that the doors of the NCCE are always open to the general public. Daniel Fennell, also talked about the young African leaders making impact in various communities. 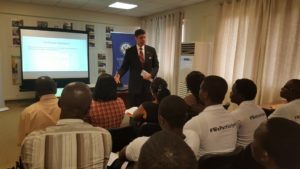 Using practical examples and making reference to the impact made through the Young African Leaders Initiative (YALI), he entreated all to make a difference regardless of how small it may seem. 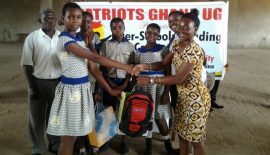 He also entreated the campaign ambassadors to take initiative, be patriotic and have a strong desire to make a difference.In the end Daniel Fennel, Head of Public Affairs, United States Embassy Ghana did the honors of officially launching the We Participate project. The 20 campaign ambassadors in the next two months would be going to at least 10 senior high schools and 4 tertiary institutions to educate youth of voting age. The project has a target of reaching an estimated direct population reach of 4000 youth. The 4000 direct reach would be sensitized to serve as peace agents to further reach at least 5 youth within their social networks, especially outside of school. Therefore, there is an estimated indirect reach of over 20,000 youth through our school outreach program. The project has also setup a Social Media Campaign, #WeParticipate which is targeting students studying in districts in other parts of the country not reached through the face-to-face campaigns in the schools. 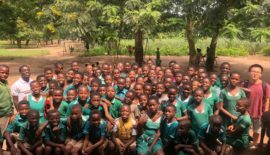 The social media campaign is reaching 35,000 total youth within the Awutu Senya East and West Districts and the neighboring communities.